A big part of digital marketing today involves generating leads – means potential customers who expressed interest in your offer – so that you can follow up with prospects to move them towards becoming a customer. 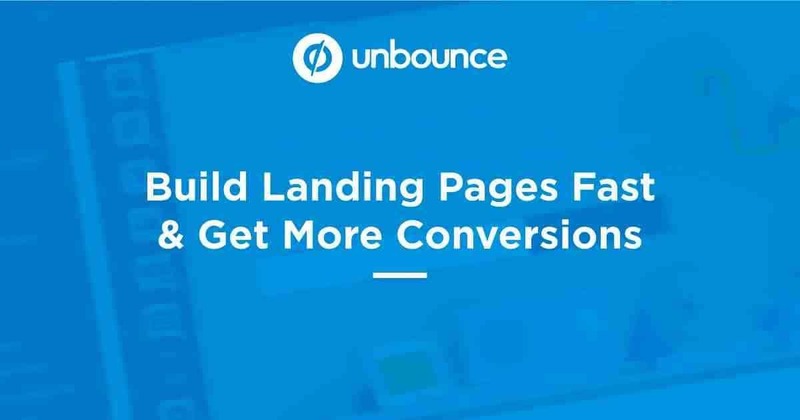 Landing pages are pages designed for the sole purpose of converting visitors into leads or customers, and they’re one of the best ways to go about generating leads. The landing page builders usually come with templates which allow you to build multiple landing pages quickly. This ends up saving you a lot of time. The templates that are included with the landing page builders are optimized for the highest conversions. There’s no guesswork involved with how you should design your page. It is easier to manage multiple landing page campaigns when it’s centralized in a single platform, especially if you’re using them for advertising campaigns. There are integrated testing tools included with these builders. You can quickly set up tests and analyze the results without having to turn to another platform. These builders are very user-friendly and easy to use as they utilize a drag and drop function. 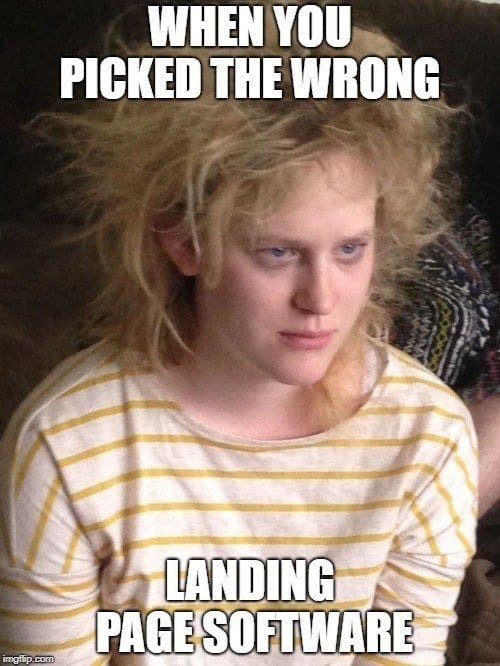 Not everyone has the design skills to create great landing pages. If you routinely outsource your design work for landing pages, it’ll be far cheaper to use a landing page builder than repeatedly hiring a freelancer for the job. What Else Can A Landing Page Builder Be Used For? Single page formats such as long-form sales letters, short video sales pages, and eCommerce product pages. Affiliate presell pages that are designed to sell the clickthrough to the affiliate offer rather than generate a conversion. This short video is a prime example of how affiliate marketers are using landing pages and what can be done to improve them. Pages designed to elicit some action via a CTA button like social share campaigns, presentation pages, and contest pages. Campaigns that are intended to pre-qualify existing email subscribers for things like webinars, booking, seminars, and other email segmentation purposes. Other helpful design elements that can help increase engagement and conversion rates such as sticky bars and popups. Because you can use these landing page builders for different purposes, you’ll end up getting a lot of value out of them and will find yourself using them for a wide range of campaigns. What Should You Look for in a Landing Page Builder? Now that you understand all the benefits of using landing page builders, you need to get an idea of what you should be looking for in a builder. Almost all of the landing page builders come with tested landing page templates, A/B split testing capabilities, and third-party integrations. But there are some differences between the various products and services. Mobile Optimized Pages – With half of the Internet traffic now originating from mobile devices, it’s important that the landing page builder you’re using takes this into account. Pricing – Landing page builders tend to vary a lot in pricing. If you are looking for simple features, you want to go with a service that offers a low-cost plan. Some landing page builders are also based on WordPress and only charge you a one time fee with optional payments for updates. Additional Features – Some landing page builders will have extra features like the ability to create sticky posts and popups, their own in-house CRM built into the service, dynamic keyword insertion for PPC campaigns, team collaboration features, and more. It’s important to identify the distinctions between different landing page products and service as your needs will be different from everyone else. While there are many different landing page builders in the market, there are seven products and services that stand out among the crowd. Here is a rundown of the seven best landing page builders that you can use for your online business. 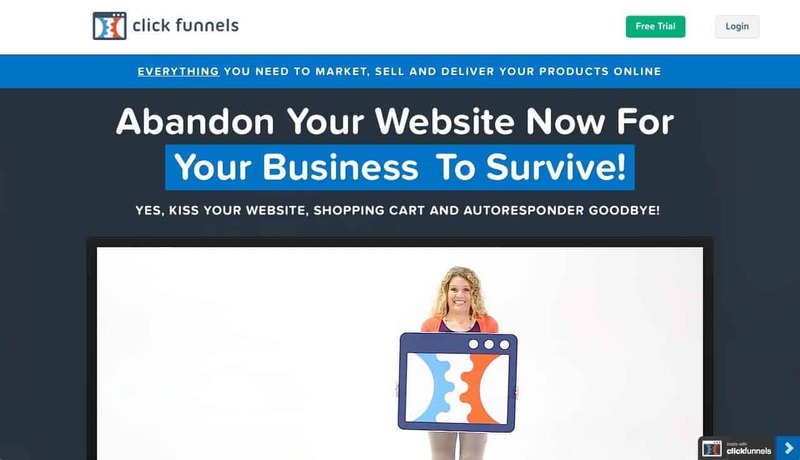 Clickfunnels is different from other landing page builders as the advanced plan offers a full suite of solutions including an integrated affiliate program, smart action funnel feature, and shopping cart builder. The company also plans on including its own CRM platform and membership site management software. As for the builder, it does everything the leading landing page builders do but focuses more on the email marketing funnel side of things. It Makes you save lots of hours thanks to all the pre-made templates to set-up money making funnels fast. Other tools take way more time to charge the page and connect each page to the others. It’s beginner friendly, but it’s used by advanced users as well. Building and managing funnels can really get complex, but Clickfunnels makes it easy for anyone to understand what’s going on. It is results oriented. Clickfunnels wants to make you money. There’s very little interest in aspects that might look fancy but don’t bring more revenues. There are so many more features than other landing page builders. The ability to run your own affiliate program and use their in-house CRM (coming soon) can be incredibly valuable to some online business owners. Clickfunnels Pricing starts at a $99 a month price point. This is quite expensive if don’t have a huge budget when starting out. Some customers have complained about their customer support. It seems like the company is really backed up, and customers sometimes have to wait an hour or longer to get the help they need via live chat. Instapage is one of the most popular landing page builders in the market. It is straightforward and easy to use builder. It has some unique features like the collaboration platform that allows you to communicate with team members under the centralized Instapage platform. The optimization features include a heat map and dynamic text placement to help you increase conversion through personalization. Customers, particularly those who don’t have web design skills, loved how easy it was to use. Many were able to design winning landing pages without any problems. The real-time collaboration feature comes in handy for organizations that rely on a team to manage and work on multiple campaigns. The company is known for having one of the best customer support teams. They are available via email and live chat. Enterprise clients are given phone access for one on one support. The only plan that is available is the $99 a month plan. This may not be the ideal pricing for those just starting out with a business online. It does lack some of the advanced features that you can find in other landing page builders. Thrive Architect is a landing page builder designed for WordPress. Like other builders, it is a drag and drop builder that comes with 271 tested landing page templates. There are also dozens of conversion elements (forms, testimonial blocks, timers, etc.) that you can integrate into your landing page. It’s important to mention that their supplement product Thrive Optimize is a separate product designed for A/B split testing. It will integrate with Thrive Architect in future updates. If you prefer using WordPress and want an affordable yet premium landing page builder, Thrive Architect is a great choice. It comes with most of the core features you’ll find in other landing page builders. It can also be used to build just about any type of single page site. A single license costs $67 which is far more affordable than other landing page builders that charge you every single month to use their platform. Multiple licenses are also affordable at $97 for five sites and $147 for 15 sites. Thrive Optimize is a great stand-alone product. The A/B split testing software keeps things simple while offering powerful reporting/analytics features. You’ll also appreciate that your data is kept to yourself since it runs on your own site. It’s a little confusing why Thrive Architect and Optimize are separate products when they should be an all-in-one package like other landing page builders. You simply end up spending more to get Thrive Optimize. It is slow! Very slow. Don’t get me wrong, I use it on several websites (this one included), and for that price, you cannot ask for more than this, but as it not on the cloud and hosted on your site instead, most of the times it will run very slow. It does lack some of the advanced features that you can find in other landing page builders. If you’re only after the core features, then this shouldn’t be a problem. Landingi is another straightforward landing page builder that has the core functions you’ll need to build, manage and optimize landing pages. It has a great UI that allows you to pull from their image and font library. You can easily duplicate landing pages with a single click. Like Instapage, they also have a collaboration feature to make it easy to communicate and work within a team. You can an extensive rundown of their features on this page. It has all the standard features you need and offers some extra that gives it a slight edge over competitors. This includes their large image and font library, hosting on AWS for faster performance, and the landing page scheduler to stay organized. Landingi excels all across the board. The template designs are great, the platform is easy to use, the pages are easily customizable, the designs are mobile optimized, and the service offers excellent customer support. Unlike other landing page builders, you only pay for what you need. The cheapest plan starts at $29 for the basics and moves on to $49 for the advanced features. The Agency plan is $109 which is still a great bargain as it offers extra features that help you manage clients. Aside from a few advanced features, you can only find in services like Clickfunnels; there aren’t any cons noteworthy of mentioning. It’s a great all-around platform that’s used and trusted by many customers. Unbounce is another popular landing page builder with all the core features. Its standout features are its ability to work with WordPress, dynamic text placements for personalization, faster pages for mobile devices, parallax scrolling, and popups + sticky bars. The popups and sticky bars can be launched based on various triggers as well. The parallax scrolling features is a nice touch that can increase engagement on your landing pages. The fact that this combined with faster mobile performance is a plus. The popup and sticky bars are a nice feature but nothing too impressive. That said, they will help in increasing conversions, and many users will find them useful. The price point starts at $79 which is cheaper than other premium builders. However, they set a limit of how many landing pages you can use for each plan. Leadpages is the leading landing page builder in the market. It has all the standard features you’d expect from the popular landing page builders. However, it has some nice additions like the Facebook instant ad creator and popup creator (and other assorted display triggers). These special features make it easy for you to create a Facebook ad and quickly integrate a Leadpages landing page into your campaign. Leadpages offers the lowest price point among the top landing page builder services. This makes it affordable for those who are just starting out with their online business. Leadpages is one of the few companies that offer weekly coaching calls for their customers. This can be very valuable for new digital marketers looking to learn how to get the most out of Leadpages. The extra popups and other display triggers are all nice additions to the platform. These features can be used to further increase conversion rates based on how they’re used. Their CRM integrations are only available for their most expensive $199 a month plan. This integration comes free with the basic plan for other landing page builders. 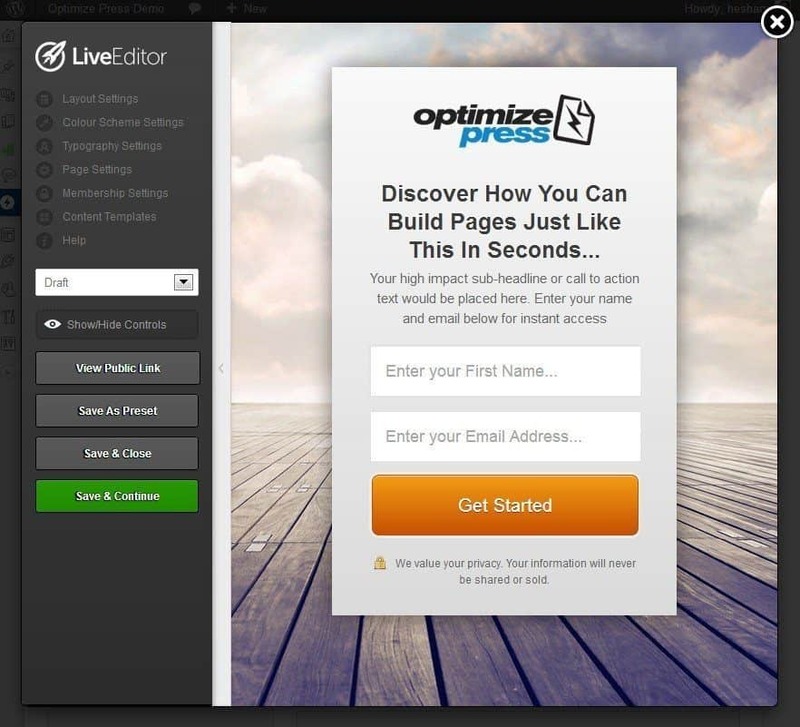 OptimizePress is another WordPress based landing page builder. However, it is a little more versatile in that it helps you build other types of pages from membership portals, blogs, sales pages, and more. As a result, you get access to various types of templates and not just lead generation landing pages. There is also a huge library of graphical elements for you to use so that you can build the perfect site. – You only pay a one time fee of $97, $197 or $197 depending on the features you want and the number of sites you want to use it for. – OptimizePress offers more templates than most landing page builders and different types of templates. You’ll end up using it to create various pages. – The extra features like the membership site plugin, video backgrounds, page engagement elements, and bonus plugins. Most landing page builders do not come with these features. – You get a year of support and updates but after that year, you have to make an updated payment within 30 days of your last month. So which one out of the list is the best landing page builder? There isn’t a clear answer. It really boils down to your situation. 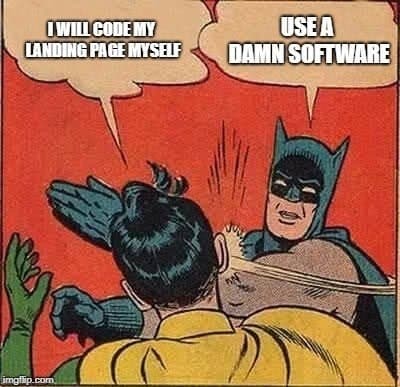 If you’re looking for a cheap landing page builder, Leadpages and Landingi are great solutions. If you’re looking to build advanced marketing funnels and an all-in-one solution, and you can afford the price, Clickfunnels may be the best bet. If you have some experience with designing and managing your own WordPress site, you may want to go with Thrive Architect or OptimizePress. The best thing you can do is really figure out what your needs are and what situation you’re currently facing. From there look at the special features of each solution and choose the one that is optimal for you. Disclaimer: We occasionally link to products and earn fees. We only review products we trust.